Daily Illuminator: Our Most Spirited Issue Of Pyramid Yet! May 8, 2015: Our Most Spirited Issue Of Pyramid Yet! Gaming is always spirited fun, but this month's Pyramid takes that notion to the extreme! The power and potential of your inner self is within your grasp, with Pyramid #3/78: Unleash Your Soul. 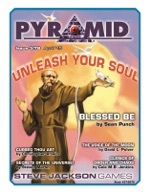 This issue features a mini-supplement from Sean Punch devoted to one advantage: Blessed! That powerful ability is broken down into component parts, which you can reassemble in countless new and interesting ways. Build your own variant of Blessed, or become a Crusader of Light, Angel-Blooded, a Wilderness Guardian, or much more! This issue also offers a similar mini-supplement for the Divine Curse disadvantage, letting you reuse it in myriad ways. Become a Marked One, a Sower of the Wind, or other terrible threats . . . or become a master of curses yourself. Two mini-supplements aren't the end of the excitement unleashed by this Pyramid! This issue further gives you new cleric options for GURPS Dungeon Fantasy, a cult with strange powers (suitable as an adversary or a heroic background) from the mind of David L. Pulver, and other awesome goodies. The soul of Pyramid is fun, and Pyramid #3/78: Unleash Your Soul definitely delivers! Pick it up individually, or subscribe to Pyramid today and get this issue along with more essential GURPS reading for months to come!